We at Unsui try to serve buckwheat noodles, which have good flavor and great taste throughout the year to please any pallet. 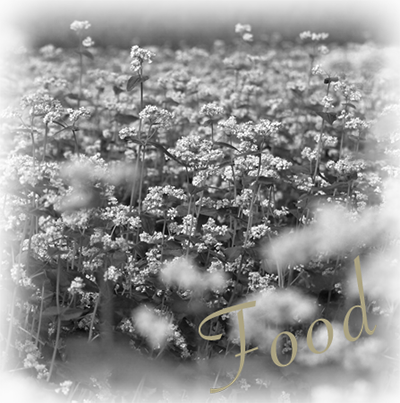 Our noodles are made from 100% domestic buckwheat. The combination of buckwheat flour depends on the season, which varies the mixing amount from between 70 and 80%, so that we can always serve the best quality noodles. When you eat our firm noodles, you will find their texture just right and delicious. Soup plays an important supporting role in the dish. The taste of soba-tsuyu (soup for buckwheat noodles) divides people into two groups: those with a preference for a mild taste or those for a dry one. Although some say the dry taste goes well with soba (buckwheat noodle), we believe it is the mild taste that is loved by everyone from every generation. The point is for the noodles not to be too thick and to have a moderate mild taste. Soup for soba is a kind of blend. The soup’s fundamental soy sauce base is mixed with broth made from bonito and kelp. The proportion of the base soup depends on its use. The soup for Echizen Oroshi Soba differs from that used for Zaru Soba (soba served with dipping sauce). Our restaurant serves all dishes with a slightly mild taste in order for you to be able to enjoy the natural flavor of the buckwheat noodles. 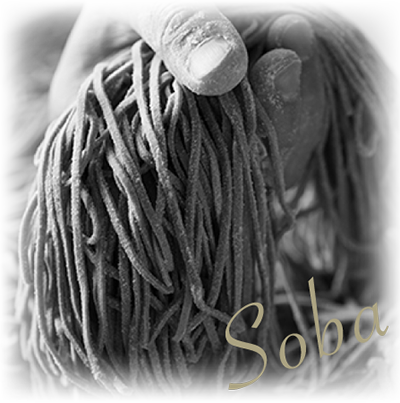 As is often the case with soba restaurants in Fukui, the menu begins with oroshi soba. 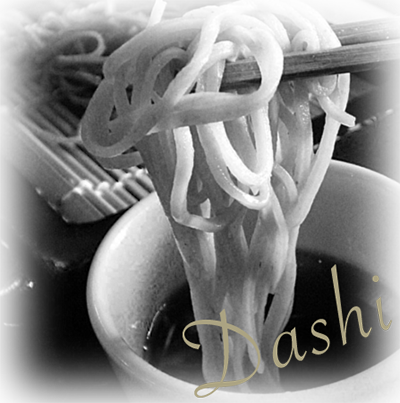 It is speculated that oroshi soba’s extensive history originated in 1601. 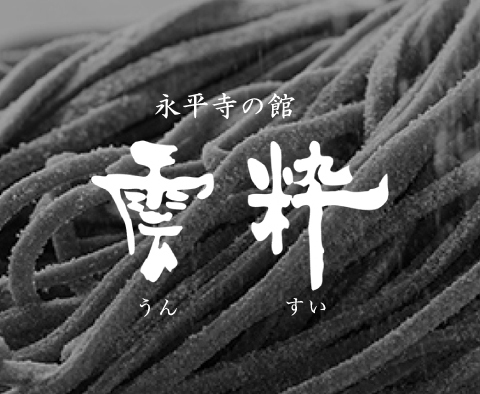 The origin starts with Tomimasa Honda, a lord who came from Kyoto to Takefu City accompanied by a soba specialist, Gonzaemon Kaneko, and ate boiled thin soba noodles with minced white radish similar to today’s style. The soup for oroshi soba is blended only as needed for each day. The base soup is not reused, and the noodles are served separate from the pouring soup, in order to keep the natural flavor of the buckwheat. 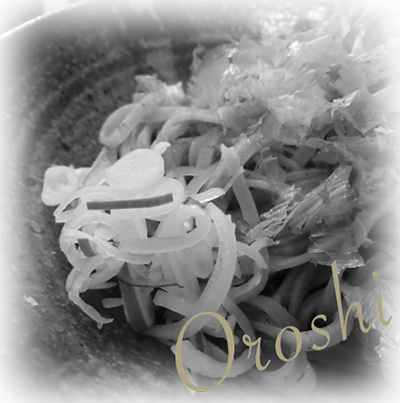 The sharp taste of white radish, which is necessary for oroshi soba, goes great with the soup. Domestic buckwheat flour is delicious. It has a natural taste without artificial flavor, thanks to the Fukui’s pure nature and fresh water. We focus on the ingredients that exhibit good quality, and stock them only when they satisfy our criteria. Needless to say, we use only “heartfelt foods”, which is to say, with our customers in mind, we always consider the choicest ingredients. In short, if our cook is satisfied, our taste is assured.